It’s game day in Evanston! 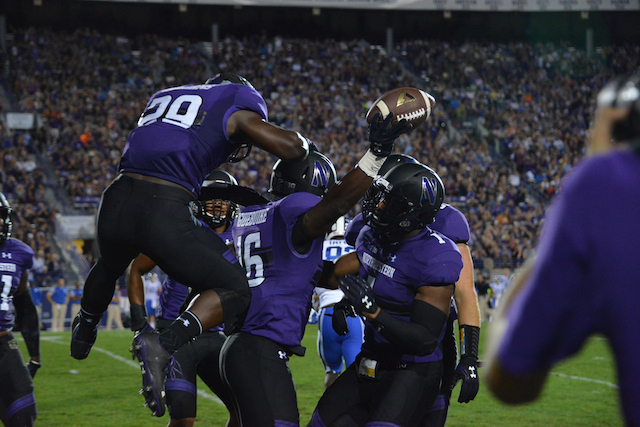 Northwestern (1-0) hosts the Duke Blue Devils (1-0) in their home opener at Ryan Field at 11am CT today. After handily defeating the Blue Devils in 2015 and 2016, the team dismantled Northwestern by a score of 41-17 in Durham last year – putting a huge hole in the Wildcats’ resume before conference play began. Lining up against an impressive Duke squad in 2018, Pat Fitzgerald and company look to turn that loss into fuel for an important win. NBN Sports looks at key matchups and players on the offensive side of the ball to prepare you for kickoff. After the Wildcats put up 31 points in the first half of the season opener at Purdue, many fans were optimistic that the offense would speed off with the victory for the next two quarters. Instead, not only did Northwestern let off the brakes, but the whole engine exploded: the ’Cats piled up a measly 55 total yards on its next four drives, and failed to score for the rest for the game. Now facing Duke, who just beat Army 34-14, Northwestern will look to resolve its offensive sputtering if it wants to avenge its 2017 loss to the Blue Devils. Jeremy Larkin impressed fans in his first start as running back, getting 26 touches for 143 yards. He’ll be the first major threat on the ground for Duke, as Army had five different rushers carry at least five times each. The Blue Devils allowed an average of 3.6 yards per run, meaning Northwestern’s offensive line will need to outmatch them. Duke defensive end Victor Dimukeje and defensive tackle Edgar Cerenord picked up six and seven tackles against the Black Knights, respectively. Right tackle Rashawn Slater will look to win the sophomore matchup against the lighter Dimukeje, while left guard J.B. Butler and center Jared Thomas will cover Cerenord. The O-line didn’t allow any sacks against Purdue, which was certainly a relief for both Clayton Thorson (recovering from ACL surgery) and T.J. Green (playing his first big-time minutes). Both quarterbacks will likely see playing time versus Duke, but the main pressure will be on Thorson after a lackluster second half against the Boilermakers. Flynn Nagel, Ben Skowronek, and Cameron Green split a majority of receiving yards. Rover safety Dylan Singleton (11 tackles) will likely cover Skowronek, meaning Nagel and Green may see more targeted passes. Part of what did Army in against Duke was two lost fumbles. Northwestern’s main goals should be keeping possession safe and maintaining a steady passing game. If the ’Cats can do that, then we can avoid hitting the panic button on the offensive side of the ball. Duke player David Cutcliffe brings back most of his playmakers from a defense that ranked 21st in total points allowed last season, including his top eight lineman and top four linebackers. The D will be led, however, by junior cornerback Mark Gilbert, who returns for the Blue Devils amid NFL interest. ‘Cats fans may remember him for his two interceptions in last year’s 41-17 beatdown in Durham. Gilbert finished second in the ACC in both interceptions and passes defended, but only one other starter returns from a secondary that ranked 6th in pass defense. In their first game against Army, Duke gave up almost 200 passing yards to a triple option quarterback in Kelvin Hopkins, Jr., suggesting that they may be prone to giving up chunk yardage through the air. Earning yards on the ground, though, will be a trying task for Jeremy Larkin and company. The Blue Devils’ strength on defense lies with their front seven; linebackers Joe Giles-Harris and Ben Humphreys led a unit that only allowed one touchdown on the ground to a normally potent Army rushing attack. Giles-Harris, who led the team with 125 tackles last season, was named preseason all-conference, and he along with Gilbert are the most pro-ready players on the Blue Devil defense. Edgar Cerenord, Victor Dimukeje, Drew Jordan and Derrick Tangelo form the core of a speedy defensive line that pressured Clayton Thorson into four sacks last year. The Blue Devils have a young and athletic defense with the potential to be one of the top units in the ACC. The key to avoiding a repeat of last year’s dud will be in how the O-line handles the Duke front seven, and whether or not Thorson (or T.J. Green) will be able to shift pressure from Larkin on the ground. Assuming Gilbert will cover Skowronek, one of Flynn Nagel, Jalen Brown, Riley Lees, or any other of Northwestern’s young receivers must step up against Duke’s similarly inexperienced secondary. Duke has the linebackers in Giles-Harris and Humphreys to hold down Larkin’s production if the passing game stagnates, but a more dynamic Wildcat offense can put points on the board against a still growing D.